David Koresh and a number of the residents traded in guns, a legal business enterprise in the 00US. For non-US visitors who don't understand why Americans want to own guns, history provides the answer. The American Revolution came about in part because Americans considered that individual persons have an inalienable right to self defense. They did not consider the King had Divine Rights. The government's right to use force arises only because it is the agent of the people in their legitimate right to self defense. Other residents of Mt. Carmel had regular jobs in the surrounding communities. Many people from all over the world came to Mt. Carmel to reside there temporarily while studying the Bible with David Koresh. 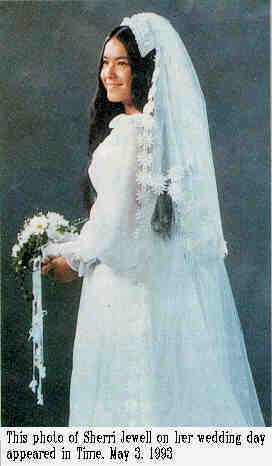 This photo of Sherri Jewell on her wedding day was published in Time, May 3, 1993. The remains of Sherri were identified among the casualties as Mt. Carmel Doe 11. Some years before the raid, there had been a political power struggle between Koresh and a rival for the leadership of the Branch Davidians. When Koresh became victorious, members of the losing faction contacted the authorities with stories that Koresh hoarded illegal arms and engaged in unorthodox marital practices with women. Further allegations of child abuse arose against David Koresh from a custody dispute involving Branch Davidian Sherri Jewel and her ex-husband. These complaints against David Koresh found their way to the US Treasury Department's Bureau of Alcohol, Tobacco, and Firearms (BATF or ATF). The BATF has the statutory authority to collect taxes on firearms possessed, purchased, or traded. Hence, it was this gun business that provided the pretext for the action, and it was the BATF, or ATF as it is often called, that provided the front for the operation. According to the Treasury Report, David Koresh was allegedly converting regular guns into machine guns, and that he possessed machine guns for which he did not have a license. Non-US visitors should know that in 1993, it was legal to own a machine gun in Texas provided the tax was paid. At that time, the tax levied on machine gun ownership was US $200. Despite the minor nature of the alleged offense, and despite the known presence of men, women, and children who were not involved in the gun business, only two methods of serving the search warrant were considered: raid and siege (Treasury Report, pg. 43). 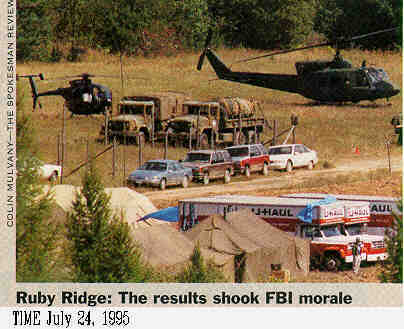 It is of interest that at the time of the action against the Branch Davidians, there was no legal limit on the number of guns Texans could own. At the time of the raid, Texans owned an average of four guns each and 16,600 Texans legally owned machine guns. In order to own a machine gun legally, the owner had only to pay a tax to the ATF. Kevin S. Van Horn, Assault on Waco (kevin@axon.cs.byu.edu). It was on the pretext of this relatively minor tax on guns that the assault and siege took place, with the resulting deaths of approximately 80 Americans, including many children.